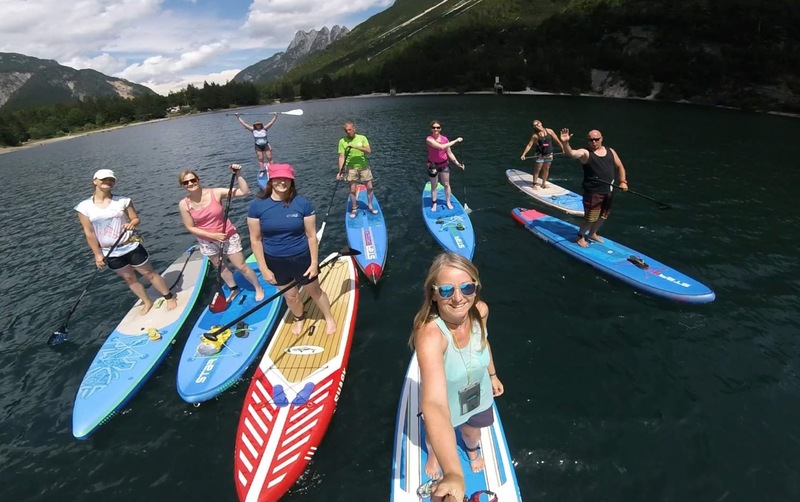 SUPing in Slovenia might not be on everyones paddling ‘to do’ list. But why not? Despite only having 46km of coast, this stunning, hidden gem of a country, has so much to offer paddlers both on and off the water. Tranquil rivers and lakes surrounded by beautiful mountains, caves and fairy tale castles provides a paddlers paradise. And the friendly vide and fantastic diverse cuisine makes the waterside towns the perfect place to stop and unwind after an active day on the water. This time 5 years ago I was lucky enough to be sent to Ljubljana, Slovenia to run a set of ASI Instructor workshops. Little did I know what I was letting myself in for! I had no idea at that time that I would become involved in a love affair with this country. It wasn’t long after I returned from that first visit that I decided to share this beautiful and diverse country with my SUP buddies. I have each year returned with a group to paddle and holiday in paradise! This year was no exception. Early July saw a mixed group of Irish, English and Germans head out to our hosts Amfibija SUP. Since my very first visit Natasa has been my host. She always makes sure that we have a trip to remember for a lifetime and this year would be no different. Our holiday began in Venice where we were collected by Natasa in a brand new air conditioned mini bus, our transport for the next week. A couple of hours through Italy and into Slovenia brought us to our apartment for the next 4 nights. Situated in a quite part of Ljubljana and only a short walk into the city centre we were not short on fabulous restaurants and bars. Day 2 of our adventure brought tropical storms and lightning that caused the group concern considering Ireland and the UK were in the midst of a heatwave. 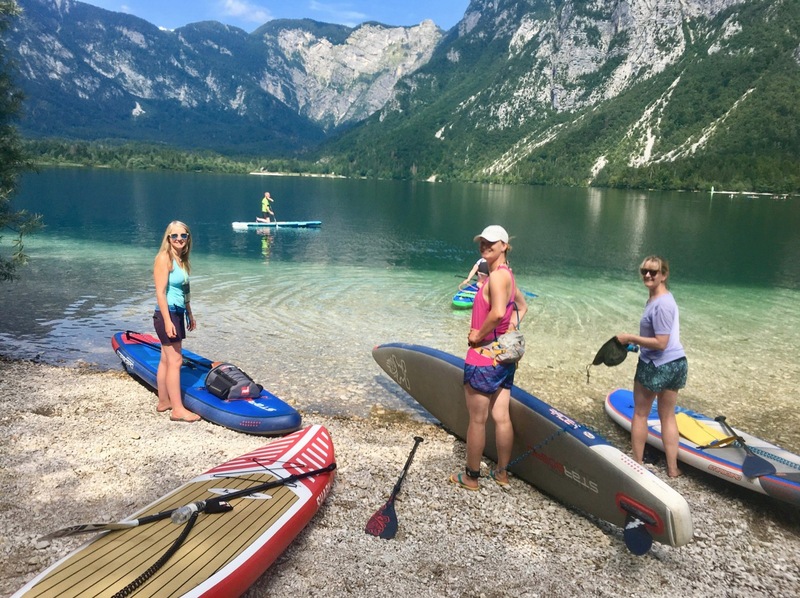 While this didn’t allow us do any paddling, it was perfect opportunity to head to another of Slovenia’s major attractions and it was off to Postojna Caves for the day. 24,000 meters into the side of a mountain and 115 meters below sea level made it easy to forget about the rain outside above ground. Day 3 saw us on the coast sampling a bit of the very short Adriatic coastline stretching approximately 43 km (27 mi) from Italy to Croatia. We paddled from Portorož to Piran and back. Piran is one of the loveliest towns anywhere along the Adriatic Coast, it sits pretty at the tip of a narrow peninsula. Its Old Town – one of the best-preserved historical towns anywhere in the Mediterranean – is a gem of Venetian Gothic architecture, but it can be a mob scene at the height of summer. In quieter times, it’s hard not to fall instantly in love with the atmospheric winding alleyways, the sunsets and the seafood restaurants. This is one of my favourite paddles of all time! No trip would be complete to the coast without visiting Cacao, probably the best ice cream on the Slovenian coast. Definitely the widest variety. Try Whitepista, Walnut with fig or Wild strawberry. Also a great location with sofa style seating right on the beach. Before we left the capital city, we could not go without paddling the River Ljubljanica. Ljubljana is a city of beautiful and architecturally interesting bridges. Its river, the Ljubljanica, is believed to have been first spanned by a bridge in the Roman period. The heart of Ljubljana’s social life is the Ljubljanica river embankments, densely scattered with lively cafés offering outdoor seating. A good way to see the old city centre and its famous bridges, picturesque buildings and vibrant embankments from a completely different angle is to SUP right up the middle. Lucky for us on Fridays the city has an open kitchen, one of the best gourmet experiences in Ljubljana. The food array is always diverse and vibrant, ranging from the best traditional Slovenian dishes to dishes typical for other parts of the world. The food is delicious and very fresh, it’s even prepared before your eyes right on the square. All of these tasty dishes and desserts will be enhanced even further with a rich selection of wines, beers, cocktails and other tasty beverages. I was now starting to wonder if it was not the Slovenian food and drink that was bringing me back year after year? The rain was behind us and we were getting very comfortable temperatures in the high 20s. 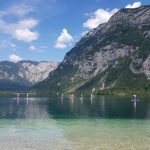 Unfortunately day 5 saw us pack our bags and head north to the Julian Alps but not before visiting some of the most mountain lakes Slovenia has to offer, Lake Bohinj in the morning and the infamous Lake Bled in the afternoon. It is no over statement to rank Lake Bled & Bohinj amongst the most beautiful Lakes in the Alps. Lake Bled is a world famous destination, named by Yahoo Travel as one of the World’s 10 Most Beautiful Lakes and not without good reason – surrounded by mountains and with a fairy tale castle perched on a crag overlooking a 17th century church on an island, it is an outstandingly beautiful place. Lake Bohinj, less than half an hour’s drive west from Bled is located in the Triglav National Park and has an altogether more remote and tranquil feel – the serene lake, surrounded by beautiful mountains and quiet villages is a superb place to rest and unwind bobbing along its tranquil waters. Day 6 took us along incredible mountain roads to the River Idrijca at Most na Soči. This river trip was the group’s favourite, turquoise blue waters, swimming holes and a little taste of wild water, will leave long lasting memories in many minds. All followed up by super Italian pizza and gelato, what more could one ask for…lol. Our last day of paddling was over the boarder into Italy on another spectacular mountain lake. I’ve no idea what altitude we were at here but I swear I think I saw Ireland at one stage. Back to Venice on day 8 and we went our separate ways home. This holiday brought our little group very close together and lifelong friendships were begun. Awesome SUP locations, so much good food and drink, and great craic….. what more could one ask for….! Already looking forward to next year’s trip… who’s in? Big thank you to Natasa and Źiga of Amfibija SUP for providing us with another memorable trip. Make sure you look them up if you’re ever heading that way…. they are the best! 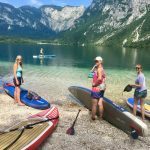 Well Slovenia certainly sounds like another great place to paddle. But to make the most of it and enjoy everything the country has to offer, be prepared to do as much chilling as paddling!